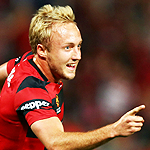 Highlight: Scored on his A-League debut for the Wanderers against Brisbane Roar in Round 1 of Season 2015/16. Description: A troubled but talented attacking midfielder with a fierce shot and a talent for getting into the opposition's faces, Nichols had a good first season for the Wanderers, but slipped away in his second, managing to score just 1 goal in the A-League. His fall from grace was compounded when after his release, he was arrested for cocaine possession at a Sydney nightclub. So sad as I'm a fan of butters but he has messed up and I wish him all the best as I can see FFA making an example of him despite no positive drug test. So, he's aiming for the Columbian league??? Well thats in the US- District of Columbia. Please use this thread to discuss the cocaine incident. I'll lock the thread, might update it occasionally if there are new developments. Tony Sage has another mate to party with. Two years doing lines off instagram models. Poor Mitch. Can he serve his four match suspension in FFA cup games? Or only the A-league? Knowing the FFA he'll probably serve it in pre-season. Apparently, he will miss the FFA Cup game against Heidelberg. If Perth fail to qualify, he won't be a Spotless in our Round 1 game. Nichols having a great game tonight for Perth sets up goal with nice run and great pass to Castro . I miss you 15/16 Mitch . Oh wow. Wonder what happened there. He had an assist last week i think. Just like most families do when they have family issues, he's joined Persela Lamongan who are part of the Indonesia 1st division. Nichols only needs 5 more to complete the A-league sweep and play for all the teams.